Solange Knowles has had a consistent and varied career since she launched in 2003, with the playful R&B funk of Solo Star. Sol-Angel & The Hadley St. Dreams was a glorious multi-coloured masterpiece that should have been huge in 2008. In 2012, she released the sleek ’80s-inspired record mini album,True, which featured ‘Losing You’, one of the best song and video combinations of recent years. With each album, Solange seems keen to avoid repeating herself. 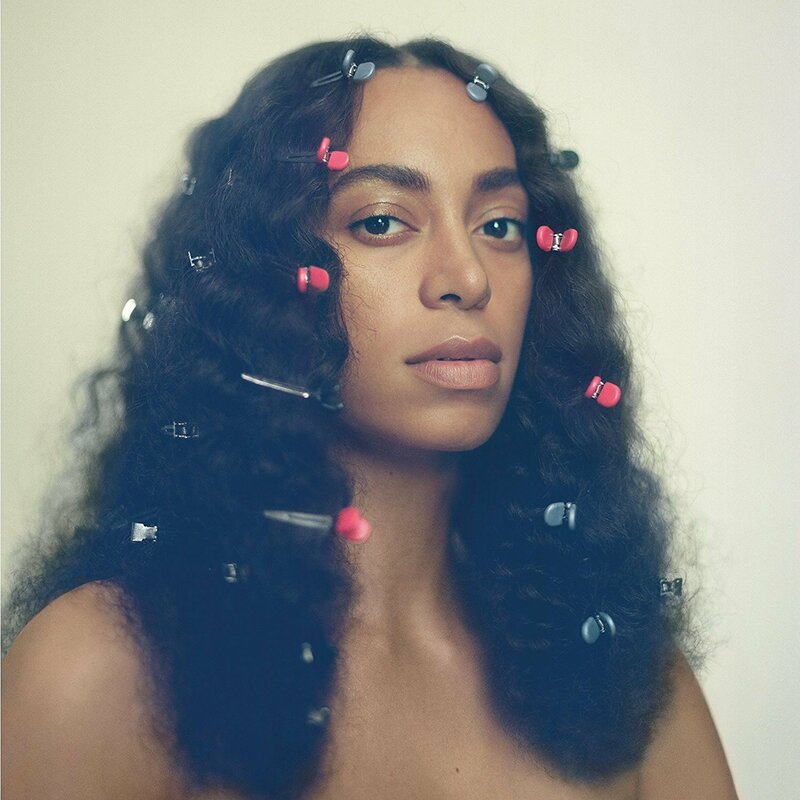 With the surprise release of A Seat at the Table, Solange has changed direction again with another brilliant record that delivers her most socially-conscious message to date. Her profile is higher than it’s ever been, thanks to the success of ‘Losing You’ and increased interest in her social life. It would have been easy for her to make an album full of obvious radio hits. Instead, Solange has used her exposure as a platform to make a record that deals with important themes – especially the Black Lives Matter movement. ‘Weary’ sets the scene with Solange singing, “I’m weary of the ways of the world.” It’s an open and honest sentiment that will resonate with many. The gorgeous, ‘Cranes in the Sky’ is the album’s highlight. She lists all the ways she’s tried to distract herself from her worries, over a beautifully sad and simple string arrangement. Her tender vocals are calming and strike the perfect balance to the vulnerability of her self-reflection. The layered harmonies and flourishes of keyboards are characteristic of Solange’s best work. She channels Janet Jackson on the powerful, ‘Don’t Touch My Hair’ as she deals with a lack of respect and a frustration at not being able to truly be herself: “They don’t understand what it means to be me.” At times it’s an angry record, but the songs are cloaked in sweet melodies and lush, soothing production. Another highlight is ‘Junie’. It’s the album’s most commercial song with squelchy Zapp-like synths and a catchy beat that’s reminiscent of Erykah Badu at her most vibrant. A Seat at the Table is a musical tribute to black music. The atmospherics are often rooted in ’70s soul (in particular, the incredible blissful soul of Minnie Riperton). The jazz-inspired rhythms and slight grooves of the basslines recall D’Angelo and Bilal at their most loose and understated. And then there is the impressive list of collaborators: Q-Tip, Kelela, Raphael Saadiq, Andre 3000, The-Dream and others. She even throws in a reference to ‘More Than a Woman’ by the greatly-missed Aaliyah on ‘Borderline’. This year has been a strong year for beautifully laidback R&B records thanks to Maxwell, Corinne Bailey Rae, KING, and Tweet (who provides gorgeous backing vocals here). A Seat at the Table is another addition to that list. It also stands beside some of the recent and best socially-conscious albums, such as Kendrick Lamar’s To Pimp A Butterfly and ANOHNI’s Hopelessness. Whilst this record deals with the harsh realities of life, there’s a defiant spirit that runs through it, making it a deeply effective statement. The songs are underpinned by pride, hope, fear, love and perhaps most importantly, healing. It’s an incredibly human record where Solange seems to be struggling to make sense of what’s going on in the world. She has put these mixed emotions into a focused and cohesive record full of rich textures and intricate details. The subdued nature of the songs means that they take a few listens to hit home, but once they do, it’s obvious that this stunning and vital record is one of the year’s best.